Benjamin's mother and teachers are alarmed when he begins espousing Fundamentalist Christian beliefs. Is it a ploy to ditch swimming class, or is it something more? 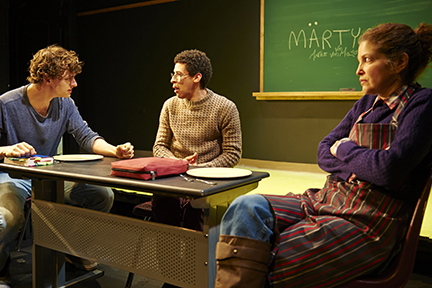 Steep brings one of Germany's most widely produced playwrights to its audiences. "The play has visceral power ... a wonderful production...We have come to expect really solid performance and direction from the Steep Theatre Company and its ensemble, and we certainly get this with Martyr"
"I recommend it very highly...a fine production of a really interesting play." "Four stars...now enjoying nervous laughter in its fine U.S. premiere...beautifully crafted ensemble performance"
"Shocking, grossly engaging and full of profound insight, this production takes real risk"
"timely...Mayenburg's play is not only relatable, it's terrifying!" The production pairs the work of one of Germany’s most widely produced playwrights with one of Chicago’s most sought-after directors. Ms. Schultz has been racking credits up all over town of late, including major productions of Venus in Fur at the Goodman Theatre and The Whale and Rest at Victory Gardens. Mayenburg’s Martyr is an oft-harrowing, oft-comical depiction of a young man’s journey towards religious radicalism. The play premiered at the Schaubühne in Berlin in 2012 and has received subsequent productions in Russia and France, but in a time when the United States is coping with religious fanaticism both at home and abroad, Steep’s American premiere promises to carry particular resonance. Marius von Mayenburg is a playwright, translator, dramaturg, director and one of the most widely produced German playwrights. His plays regularly receive productions at the Schaubühne in Berlin, the Royal Court Theater in London, and other major theaters around the world. Mr. Mayenburg’s first play, Fireface (Feuergesicht, 1997) premiered at the Kammerspiele in Munich and was an enormous success. It received the Award for Emerging Playwrights (Kleistförderpreis für junge Dramatiker) and the prize of the Frankfurt Writer’s Foundation (Preis der Frankfurter Autorenstiftung), and it was subsequently successfully produced worldwide and translated into many languages. In 2011, Mayenburg’s work debuted in Chicago with Sideshow Theatre’s well-received production of The Ugly One.